It’s your last chance to catch the extended showing of the Burj Khalifa New Year’s laser show, which finishes this Saturday March 31. 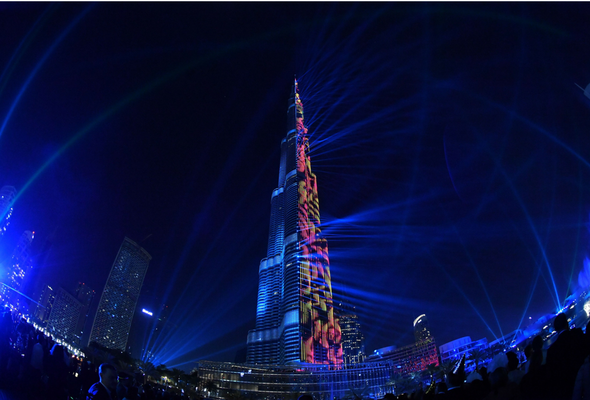 ‘Light Up 2018’, the Guinness World Record-breaking laser show that lit up Downtown Dubai on New Year’s Eve, has been replayed every Tuesday to Saturday since New Year’s Eve, and it’s well worth a watch. For those who have not had the chance to watch #BurjKhalifa’s Light show, you still can! The show goes on until March 31st! You’ll be able to catch the 7-minute-long show at 8pm on Tuesday, Wednesday and Saturday, and at 10pm on Thursday and Friday. The show, which is beamed onto one side of the Burj Khalifa and surrounding buildings, is choreographed to music, and features symbols of the UAE such as Arabic calligraphy, the UAE flag, and even a giant falcon in flight. It also highlights the fact that 2018 is the Year of Zayed, featuring a portrait of the UAE’s founding father, Sheikh Zayed bin Sultan Al Nayhan.